Join Augusta Cheer Academy and become a "National Star!" Join a tumbling class, dance class, or one of our allstar teams. We encourage athletes to push past their limits while instilling a positive attitude and creating a family friendly atmosphere. Come visit us today! Are you looking for a fun activity for your athlete? Something that will help them stay active while building strong friendships and characteristics? If so, allstar cheerleading at Augusta Cheer Academy might be the perfect fit for them. With ten season under our belt, the National Stars program is one of the most successful cheerleading program in the CSRA. We offer a variety of teams for all ages and skill levels. Whether your athlete is brand new, or has been cheering for years, we have a team for you! Our allstar packet and contract is now available, you can find it under the forms section of our website. 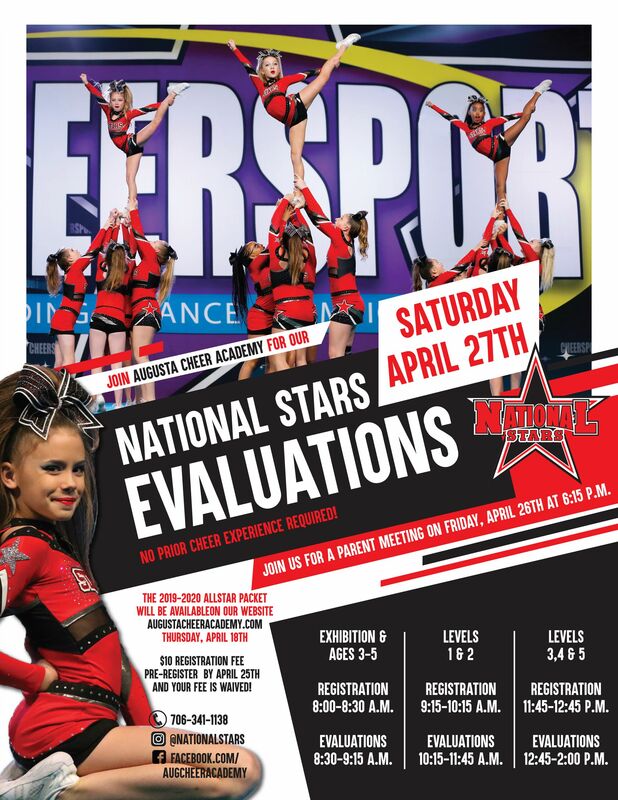 You can also join us for a parent meeting on Friday, April 26th at 6:15 p.m. Feel free to give us a call at (706)364-1138 or email us at allstars@augustacheeracademy.com if you have any other questions! We would like to take this opportunity to welcome you to Augusta Cheer Academy and thank you for visiting our website. We have everything you need to know about our gym, throughout this website. Our home page always offers the latest information on camps and clinics we may have coming up, as well as events that ACA may be hosting. Would you like to know a little bit more about our gym and what ACA is all about? Simply scroll down to the bottom of our page to see what our program is about as well as what we have to offer you or your athlete. Our "Calendar" tab offers the dates of anything that may be happening within the month, whether its gym closings or our allstar athletes competitions! Under the "Forms" section you can find anything you may need to fill out and bring into the gym, or flyers that we have with additional information for things like birthday party packages, and the allstar information for the current season. The "Information" section gives you more details information on everything that ACA has to offer! Take a look at the pictures section for a look back into previous seasons with ACA. The "Meet Our Staff" tab lets you get a little more familiar with our coaches and the impeccable cheerleading backgrounds they have. And of course the "Find Us" section makes it easy for you to stop by the gym, or easily get in touch with us with any further questions you may have! We love seeing new faces in the gym and hope to see you soon at Augusta Cheer Academy! At Augusta Cheer Academy, we would like to welcome you to the newest and only state of the art cheerleading facility in the CSRA! Providing you with all of the cheerleading resources that any athlete would need to succeed in their sport at any level. Whether you're in a school, college, or a part of our National Stars allstar program, you will reach your goals at Augusta Cheer Academy. Our coaching staff strives to make our gym a positive environment where technique and progression are a priority for every athlete. Our accredited USASF member gym is located right on Washington Road. Our facility has a perfect location; easily accessible for everyone in the CSRA. Augusta Cheer Academy is the newest state of the art facility that includes two separate gyms, two full sized spring floors, three additional panels of spring floor, four new strips of non spring floor (perfect for any school cheerleader), one powertrac (safer and more advanced than a tumble track), one air track, in ground pit, mirrors, and spectator viewing room. The Augusta Cheer Academy, National Stars competitive cheerleading program is one of the most successful programs in Augusta! We have now been open for eight years and in that time we've earned close to thirty national titles! Feel free to stop by the newest cheerleading facility in Augusta to meet our amazing staff and athletes. The coaches at Augusta Cheer Academy are the most passionate and professional in Augusta. Our staff coaches, with a combined total of over 75 years of coaching and competitive experience, works very hard to ensure each athlete can achieve their goals. We not only know what it takes to succeed but we also know how to have fun while doing it. The athletes in our facility push past their comfort zone with the trust of knowing our coaches have 100% faith in them. They strive to focus on, technique, teamwork, strong work ethic, leadership, self-confidence, and good sportsmanship at all times, while focusing on safety as our number one priority. We welcome you to come view our program and see what we are all about! We couldn't do what we do without the help from amazing people like these businesses listed below. Each of them helped our Junior Level 2 and Senior Level 4 teams attend the D2 Summit in Orland Florida. We encourage you to support these businesses that have helped to support us! 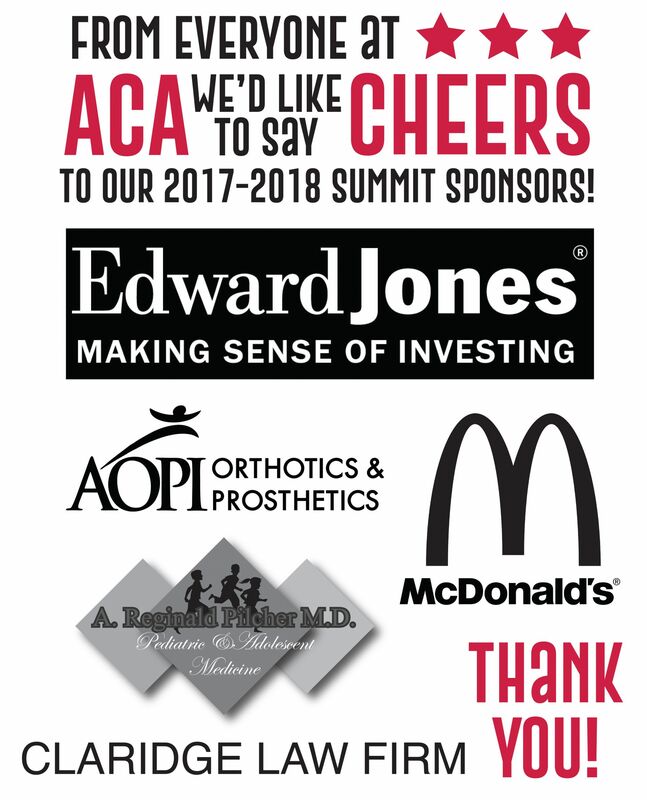 Thank you so much for your sponsorship!